Chapati - chapathi - chappati, is a common Indian bread made everyday in most Indian houses. It is also spelt and pronounced as chapatti, chapathi. 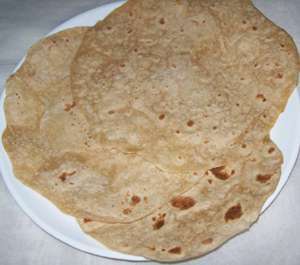 Roti is a general name for any Indian bread in general. Chapathi is made of whole wheat flour, which makes it healthier as whole wheat flour is rich in fiber content. A little Soya bean flour is also added to make it more nutritious. Now a days multigrain atta(flour) is available in the market. 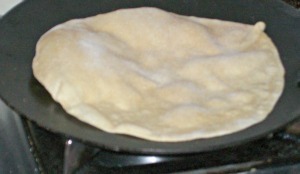 The shape of a chapathi is generally round(it is mostly round). In the North Karnataka it is also made in a triangle shape. It is of course tasty whatever the shape. It is best eaten hot but is good after a few hours too. It is a good item to take as lunch to school or office. It is eaten generally at breakfast, lunch or dinner. That is, it is a part of a main meal. It is served with vegetable fries, curries, dals or chutneys. It goes very well with a potato subji or potato curry. The kitchen tools needed for making chappati. 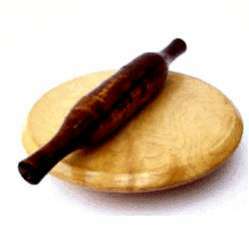 You need a rolling pin (belan - Latne - Lattanage) and a board (chakla - Polpat - Chapathi mane) for rolling chappatis.You may use your kitchen counter instead of a board but you are going to need a rolling pin. 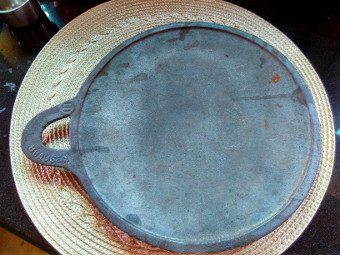 The iron girdle - skillet - tava is used for cooking chapathies. 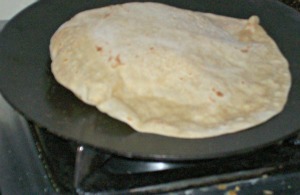 Generally, a concave iron tava is used for making chapatti. A chapati, made on a clay tava tastes great. 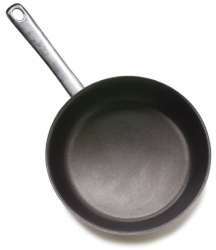 You may use non stick flat tawa or fry pan if a concave tava is not available. But generally, chapathies, do not stick to the girdle when the dough is made properly and is of right consistency. 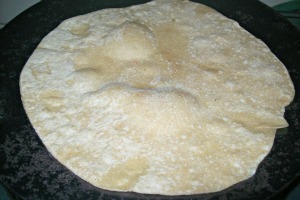 A chapathi should be soft. By following the steps given below properly you will get a soft chapati.You can see the step by step images for cooking the chapaties. Vegetable Oil - 2 teaspoons + some more to apply while folding. Mix whole wheat flour and salt and two spoons oil. Add water little by little and form into dough. Knead and keep aside for 30 minutes. Knead the chapatti dough till it is smooth. Divide the dough in lime sized balls. Sprinkle a little dry flour on the board. Dip a dough ball in dry flour. Place it on the board and roll into a small round. Spread a few drops of oil on this round. Fold in half and apply a little oil and again fold in half ( it will be a triangle now) . Roll into a round or a triangle, not too thin. Heat a girdle well and keep the heat on medium. Place the rolled round on the hot girdle. Wait for 5 seconds. Turn on to the other side and cook for 10 seconds. You can see the chapati puffing up. Turn again. It will puff up. It is important to turn the chapathi at the right time. Chapati may burn if you do not turn it. 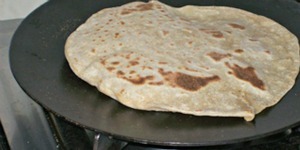 Both sides should have brown spots.That means the chapati is cooked properly as you can see in the image. Apply a little ghee or oil on the chapathi as soon as you take it off fire. Make other dough balls into chapattis in the same way and serve hot. Stack the chapaties one over the other in a box so they remain soft. Serve hot or keep them covered so that they remain soft in case you are not planning to serve immediately. Resting the dough after mixing is important. That makes the chapathis softer. Some people add oil while cooking the chapathi on the girdle. So the chapati gets cooked with a little oil. I prefer to apply a little ghee after taking the chapathi off the tava. 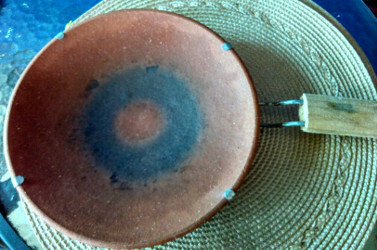 Once the tava is heated, you may keep the heat medium. High flame may burn the chapatti, very low flame will take longer to cook the chapathi and it will be harder. Enjoy chapati with any of your favorite curries or with subjis or with dals / lentil curries. 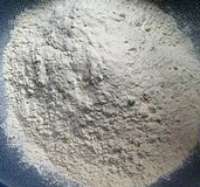 What kinds of flours are used in Indian roti - breads? - wheat flour, millet flour, rice flour etc.